← It Doesn’t Make Sense: 1. Why this world? I am happy to announce that I have a new book that is available right now to download or read online. You can access it for free at reasonpress.net. It is a response to Justin Brierley’s book, “Unbelievable? Why after 10 years of talking to atheists, I’m still a Christian”. He is the host of one of the largest Christian broadcasts in Europe, if not the world. I have been a fan of his program for a long time. When he announced that he was writing a book, I immediately knew I wanted to write a response. The response book project took on a life of its own and the finished product is a culmination of the work of seven authors. I am proud of my part in leading this team to a completed product which is worthy of your time. 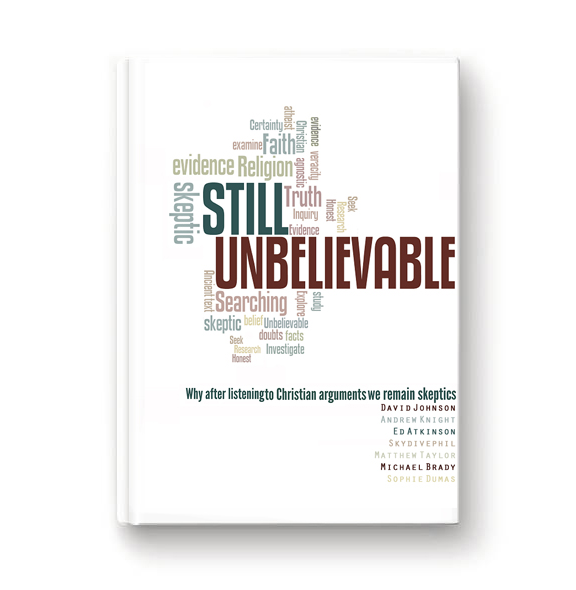 We covered rigorous science, philosophy, theology, and personal testimonies. It is a well-rounded book that has something to offer to both seekers and skeptics alike. Speaking of skeptics and seekers, we at ReasonPress have launched a new weekly blog called Skeptics and Seekers. We have an excellent Christian writer who has agreed to supply us with fresh commentary from the Christian point of view either in challenge or response to a skeptic perspective. The topics vary from week to week. Please check it out. You will be able to leave comments on each chapter of the book at the bottom of the chapter, or comment on the blog articles at the bottom of each article. Right now, we are using Disqus. But we are working on producing our own commenting system. Thanks again for following Beyond Religion for all these years. And I hope you will do the same at ReasonPress.